Lennon was killed 30 years ago on Dec. 8. These pieces are a celebration of his life, work, and family. For more about the Beatles, check out our Beatles playlist. Music fans recall how they heard the news of John Lennon's death in 1980, and what Lennon's music has meant to them. Also, excerpts from an interview John and Yoko gave on the morning of the day he died. Great Lennon music, too. A memorial and celebration, much of it told in Lennon’s own words and music, from interviews, albums, outtakes, and antics. (To mark the 70th anniversary of the birth of John Lennon - Oct. 9) Writers, Reporters, Musicians and Beatle fans share their impressions of some standout John Lennon songs, recorded with The Beatles, between 1963 and 1970. "11 from John Lennon: An Appreciation." Writers, Reporters, Musicians and Beatle fans share their impressions of some standout John Lennon songs, recorded with The Beatles, between 1963 and 1970. 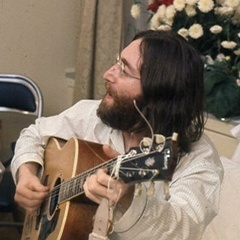 Songs include "Twist and Shout," "I Should've Known Better," "In My Life," "She Said She Said," "Tomorrow Never Knows," "A Day In The Life," "Come Together," and "Across The Universe." The program comes from award-winning Beatle program producer Paul Ingles and includes several rarely heard John Lennon interviews. The program is offered in 59:00 and a 54:00 version. There is an optional second hour but the first hour stands on its own if that's all the slot you have. Your Love Away," "Ticket To Ride," "I'm Only Sleeping," "Lucy in the Sky with Diamonds," "Rain," "Dear Prudence," "Happiness is a Warm Gun," "Julia," "I Want You" and more - complete with insider commentary and rare interviews. A second hour to celebrate the music of John Lennon to mark the 70th anniversary of his birth (Oct. 9, 2010). Writers, Reporters, Musicians and Beatle fans share their impressions of 11 more standout John Lennon songs, recorded with The Beatles, between 1963 and 1970. In 1969, musician John Lennon and his wife, performance artist Yoko Ono, were among the most high profile peace advocates on the planet. We'll spotlight the peace work of the duo back then, and hear how Yoko Ono has continued the crusade since John's death.